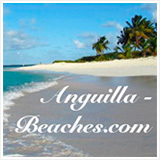 Anguilla Attractions? The Most Innovative Of All! The Pelican Trail is temporarily closed. They plan on re-opening for the 2015/2016 season. 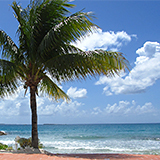 Anguilla is known as one of the flattest islands in the Caribbean Sea. Curiously, though, there is some truly magnificent scenery. 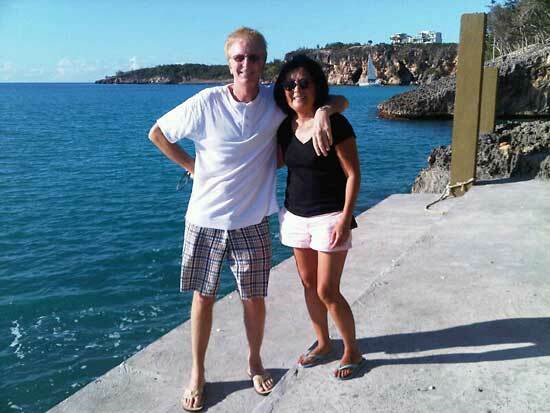 Taking an Anguilla scenic drive on a lazy afternoon is one our favorite "Anguilla attractions". 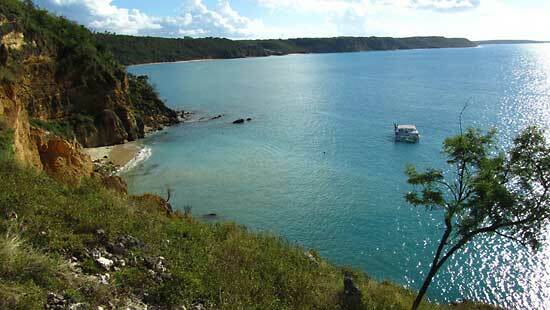 One of the best drives is taking Roache's Hill Road until you reach Little Bay. 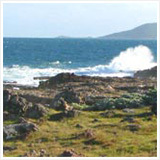 Follow each little turnoff to get a variety of magnificent views, starting with the first that overlooks Crocus Bay and Katouche Bay, and finally ending at Little Bay. The sea is so sensational as you walk over to cliff's edge and peer down. Not being the cliff-diving type, I've often wished I could take a magical set of stairs right down to the turquoise Anguilla water's edge. Well, a funny thing happened during a drive the other day. That's exactly what Ken and I did (without our daughters, who were in New York). We discovered Pelican Trail and Water Sports at Little Bay, a soon-to-be opened Anguilla innovation. How do you get there? As you drive along Roache's Hill Road, watch for a large white house where the road curves to go to Little Bay. Look for an open field adjoining (east) the home. Get out and walk toward the cliff. As you approach it, you will notice the canopy of a structure built into the side of the cliff. This is the beginning of what is one of the most innovative Anguilla attractions... Pelican Trail and Water Sports at Little Bay. No one seemed to be around, except some barking dogs from the house. 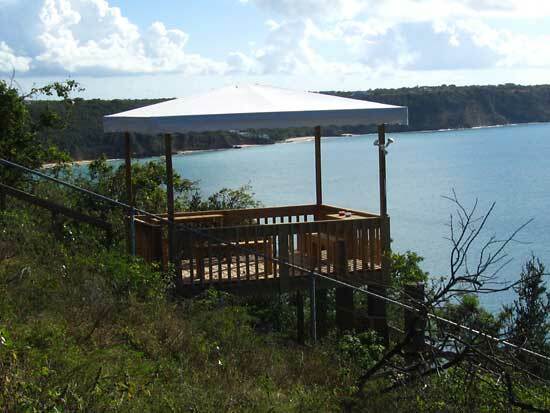 The canopy covered deck and the stairs down to the sea were behind a fence. We were "locked out." What to do? Well, we got lucky. To our delight, a gentleman emerged from the white house and asked if he could help us. Even more delightful, the man was the owner and operator of this latest Anguilla attraction, Sutcliffe Hodge. The former top executive at Cable & Wireless (now Lime), he invited us on a tour of a project that was clearly a passion. We eagerly accepted. Sutcliffe conceived this novel idea as a way for visitors to access Pelican Bay, a teeny, little-known sandy bay near the foot of these cliffs (not to be confused with Pelican Bay near Blowing Point). 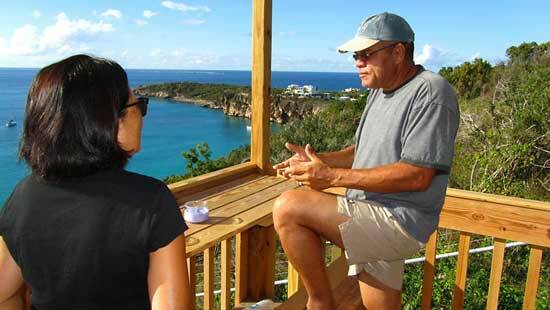 His vision for accessing the water from the cliff, was born in the '80's when he first purchased the property. 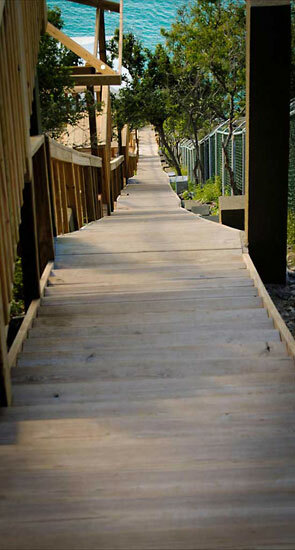 Pelican Trail has over 400 steps descending from a height of 200 feet straight down the side of the cliff. 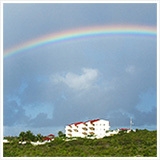 This is one of the highest points in Anguilla (the highest point is nearby Crocus Hill at 213 feet). 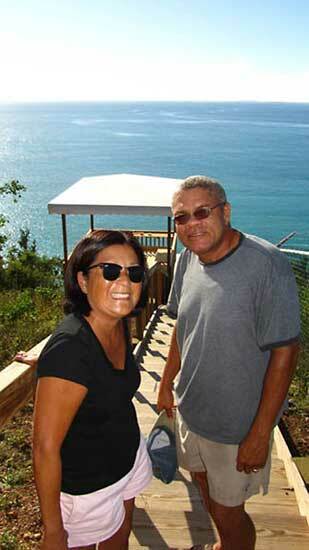 Sutcliffe pointed out that this trail is the only manmade descent in Anguilla, from this height. 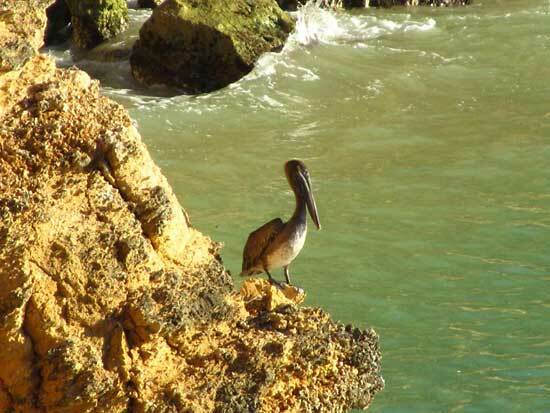 He referred to Pelican Trail as an eco-type adventure... "it takes people off the beaten path. They are able to exlore the natural environment." 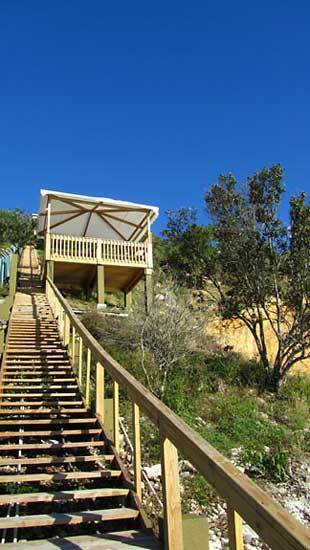 The stairs are made with a gentle slope that makes the descent easy. More importantly, you will also later appreciate that it eases the ascent! Canopied decks are spaced along the stairway trail, each one affording a spectacular view (and a rest, should you need it!). 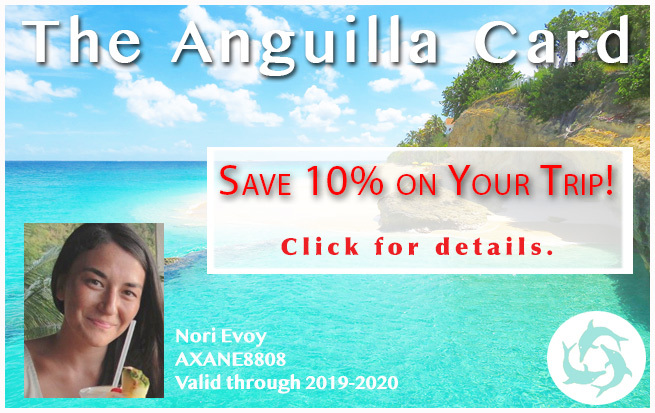 At the top of the trail you have a 200 degree panoramic view of the sea, from Crocus and Katouche Bays on your left to Little Bay on your right and four of Anguilla's off shore islands in between, Sandy Island, Prickly Pear, Dog Island and Sea Island. The stairs can also serve as a vigorous fitness workout. Accelerate your pace, going up and down. Sutcliffe mentioned that he has lost 30 lbs since the project started. He climbs those stairs with speed! If you're a little out of shape, no problem. 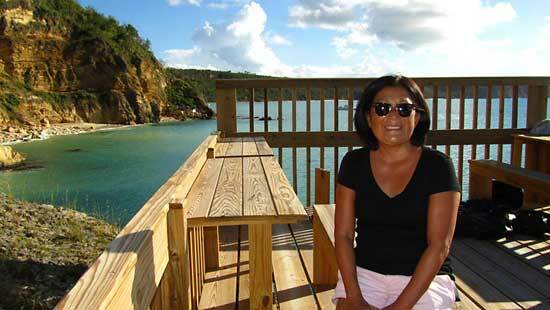 You can walk down the stairs and enjoy the scenery, have a drink or two and a bite to eat, then leave from the sea-level bottom via boat to Crocus Bay. Boats are also available to shuttle you directly to Pelican Trail at sea level. Each deck is canopied and has seating with fold up tables. While you perch on the side of a cliff in Anguilla, food may come to mind. And you may get a little thirsty. What to do? Dining can be accommodated throughout the day, from breakfast to dinner. It is served to you from La Collena, Anguilla's newest Mexican restaurant in Stoney Ground (across from Lake's Market). 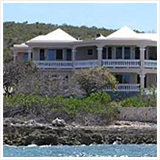 even head out on the always calm Anguilla waters to Little Bay, about 200 yards to the east. The water is always serene and clear along this part of Anguilla's coast... total relaxation. Now that's an Anguilla attraction! 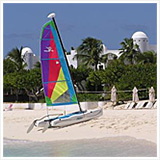 Pelican Trail and Water Sports offers a new Anguilla attraction for every time of day. Opening hour is 5am, for early risers who want to workout. 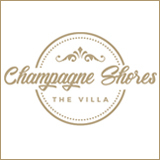 This Anguilla attraction closes at 10pm, for those who want the most peaceful, romantic dining or lounging, especially on full moon lit nights. 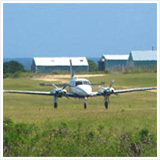 A full range of Anguilla activities, there is something for just about everyone. It was now time to make the hike back up. The long look up seemed daunting but it was surprisingly easy (and I don't work out), especially with the deck stops, breezes and spectacular views. See you on the trail. 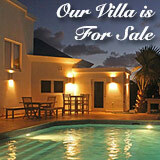 It will be one of our favourite Anguilla spots, I'm sure. For more information contact funtasticadventuresanguilla@gmail.com. 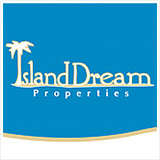 By phone (264) 235-7008, (305) 677-0421, (264) 497-3558.